Lately, rumours got spread like wildfire that Hrithik Roshan’s ex-wife Sussanne Khan is allegedly planning to marry Hrithik Roshan’s close friend Arjun Rampal. The buzz became talk of the town since there were rumours of Arjun and wife Mehr Jessia heading for a separation. Just after Hrithik and Sussanne officially got separated, rumours started taking rounds that the reason behind their sour relationship was reportedly Hrithik Roshan’s close friend and actor Arjun Rampal. There were many claims that the couple had decided to split because Sussanne was apparently getting close to Arjun Rampal. While recently Sussanne Khan’s mom Zarine Khan cleared all the waves of the rumours that have been taking rounds since yesterday. She rubbished all the rumours regarding the same. On the other hand Arjun Rampal who was in New York, seems has indirectly broken the silence regarding the rumours. 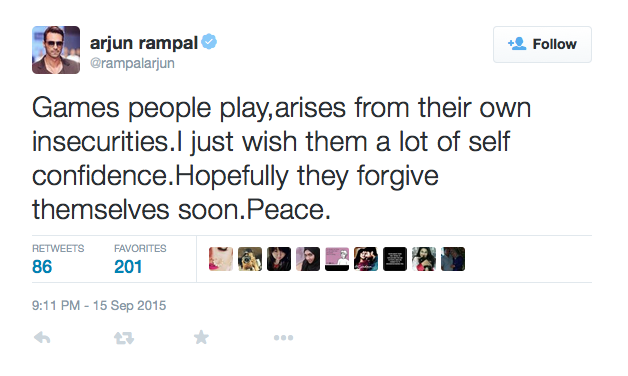 It seems Arjun Rampal has broken the silence in a very cool way by not taking anyone’s name. Arjun has kindly hit all the haters by making their mouth shut trough his one tweet. Bollywood’s ex- couple Hrithik Roshan and Sussanne Khan ended their 14 year long relationship in December 2013. The beautiful love story that had many ups and downs, ended on the bitter note. The two had a wonderful love story but for some reasons it didn’t work out for them. Sussanne, Hrithik Roshan Split: What’s The Truth? It’s all over between Hrithik Roshan and wife Sussanne. They have decided to end their thirteen year old marriage. The couple has two sons: Hrehaan (born in 2006) and Hridhaan (born in 2008). Businessofcinema.com was the first to report about this split, and then many speculations were going on. Many rumors were doing the rounds as well. But what is the truth? What exactly caused the split? Hrithik Roshan married Sussanne Khan, daughter of actor Sanjay Khan, on December 20, 2000, after dating her for four years. Their marriage had a lot of hiccups and drama even before it happened. After Kaho Naa… Pyaar Hai, Hrithik signed Subhash Ghai’s Yaadein opposite Kareena Kapoor. The rumors of Hrithik and Kareena’s romance spread, and when Sanjay Khan got to know about this, he got Hrithik and Sussanne married. The first major cracks were visible in 2009, during the shoot of the film Kites, which starred Hrithik Roshan and Barbara Mori in lead roles. Hrithik was very close with Barbara during Kites, which caused friction in his married life. Sussanne walked out of the Roshans’ home and returned to her parents in April 2009. What bothered Sussanne was Hrithik’s closeness and affection with Barbara’s family, especially his fondness for her brother Kintaro. Hrithik tried his best to help Kintaro in his singing career, he even introduced Kintaro to various Bollywood biggies, and passed on his demo tapes to various music directors. But, things didn’t work out for Kintaro. Later, Sussanne did return to Hrithik Roshan, but things were never the same post the rift, said sources close to the family. Around this time, another rumor began doing the rounds. It was about Sussanne’s friendship withArjun Rampal. This has reportedly caused turbulences between Hrithik and Sussanne. Sussanne left the Roshans’ home in September 2013, and has been living in her father’s bungalow, the Sanjay Place in Juhu, Mumbai. This time seemingly for good. All said and done, we just hope that our superhero Hrithik Roshan would use some magical super powers, and things would be back to normal between him and Sussanne. Also Read: Hotness Alarm: You Shouldn’t Miss Salman Khan’s Shirtless Selfie! Also Read: Deepika Padukone In Competition With Kangana Ranaut? Next articleWatch: Akshay Kumar Gets Dizzy And Falls On Housefull 3 Sets!